To get a clear picture of how humans and other mammals form memories and find their way through their surroundings, neuroscientists must pay more attention to a broad range of animals rather than focus on a single model species, say University of Maryland researchers Cynthia Moss and Katrina MacLeod. Their new comparative study of bats and rats in the April 19, 2013 issue of Science reports differences between the species that suggest the need to revise models of spatial navigation. In an interdisciplinary paper, the colleagues from the A. James Clark School of Engineering, the College of Computer, Mathematical and Natural Sciences and the College of Behavioral and Social Sciences worked with two scientists at Boston University to report significant differences between rats’ and bats’ brain rhythms when certain cells were active in a part of the brain used in memory and navigation. These cells behaved as expected in rats, which mostly move along surfaces. But in bats, which fly, the continuous brain rhythm did not appear, said Moss, a professor in Psychology and the Institute for Systems Research. 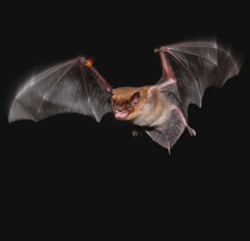 The finding suggests that even though rats, bats, humans and other mammals share a common neural representation of space in a part of the brain that has been linked to spatial information and memory, they may have different cellular mechanisms to create or interpret those maps, said MacLeod, an assistant research scientist in Biology. The research team focused on a brain region that contains specialized “grid cells,” so named because they form a hexagonal grid of activity related to the animal’s location as it navigates through space. This brain region, the medial entorhinal cortex, sits next to the hippocampus, the place that, in humans, forms memories of events such as where a car is parked. The medial entorhinal cortex acts as a hub of neural networks for memory and navigation. Grid cells were first noticed in rats navigating their environment, but recent work by Nachum Ulanovsky (Moss’s former postdoctoral researcher at UMD) and his research team at the Weizmann Institute in Rehovot, Israel, has shown these cells exist in bats as well. In rats, grid cells fire in a pattern called a theta wave when the animals spatially navigate. Theta waves are fairly low-frequency electrical oscillations that also have been observed at the cellular level in the medial entorhinal cortex. The prominence of theta waves in rats suggested they were important. As a result, neuroscientists, trying to understand the relationship between theta waves and grid cells, have developed models of the brain based on the assumption that theta waves are key to spatial navigation in mammals.